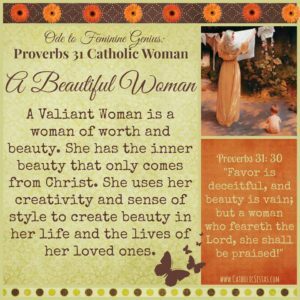 This is the ninth installment in the series of Ode to Feminine Genius: Proverbs 31 Catholic Woman. Today’s topic will cover A Beautiful Woman. A few months ago, my oldest daughter turned thirteen. Having my firstborn become our first teenager seemed almost anticlimactic; an especially precocious child, Honor has always seemed far older than she is. On paper, she’s in the 7th grade, but most of her homeschooling is from high school and college textbooks. Her height (5’5″), poise, and ability to hold conversations on complex social and political subjects tend to lead most who meet her to assume she’s in her late teens. They’re usually stunned to find out that she’s just starting that journey. 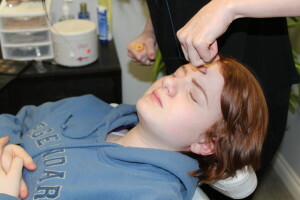 Eyebrow threading sounds less painful than waxing…but isn’t. But being so emotionally mature can have its drawbacks. Last year, our youth group leader was so impressed by Honor’s emotional maturity that she skipped her into the high school group. And while Honor could handle the discussions on gay marriage and contraception (we’d had them years ago, when she’d asked about them), she wasn’t as prepared for the social dynamics of being among teenage girls. She stopped being excited about youth group, and began finding reasons to avoid it. When I pressed her, she would complain vaguely about how she “didn’t like” a lot of the kids in the group. Show of hands–how many of us wish we’d had someone teach us how to put on makeup?? I talked privately to the youth group leader, who immediately knew what the problem was. “This is an age when girls are starting to discover their own feminine beauty,” she said. “They’re going from jeans and T-shirts and ponytails to caring more about their appearance. They’re starting to use makeup, fix their hair, and wearing trendier clothes.” The leader said that when our daughter would walk into the youth group meetings, she’d watched her visibly shrink into herself; she clearly felt dowdy and downright provincial compared to her female peers. About two months later, my daughter and I drove six hours to the “big city” of Anchorage. While there, we spent three hectic days transforming her from an athletic tomboy to a young lady. We had her eyebrows shaped. 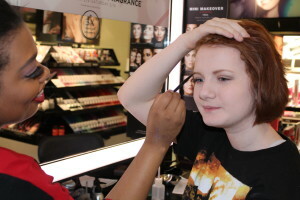 I hired a professional makeup artist to teach her how to apply cosmetics–complete with a lesson in the difference between classy and trashy makeup. We had her hair styled at a salon. We also updated her wardrobe at the mall with a few modest yet fashionable outfits. Our last stop was Nordstrom, where she picked out a lovely formal dress to wear to a Right to Life banquet with Jim Bob and Michelle Duggar as keynote speakers. The hairdresser made her promise never to change her auburn hair color. The effect on my daughter was incredible. She kept staring at herself in the mirror after we had her eyebrows shaped. “Mom, it’s like my eyes have frames now!” She smiled continuously and kept telling me how happy she was that I had planned the trip for her. We had a great time at all her “treatments,” not to mention the banquet, where both of us were giddy about seeing the Duggars in person. There were big changes at home, too. In the two weeks since the trip, she’s requested to go back to youth group again. She put on a new outfit and a little makeup and confidently walked into the group. When I picked her up, she’d had a great time talking about her love for Jesus and was looking forward to next time. She’s joined SeaScouts, too, a marine-based scouting group for teenagers. And it doesn’t bother her that she’s the only female among six teenage boys. That trip was worth every penny. En route to see the Duggars! My daughter knows that her physical beauty is meaningless if it’s not reflective of the goodness in her soul. She’s still mostly a sweats-and-T-shirt girl at home. But now she understands that God gave her more than just a vivacious mind; He gave her a genuine feminine loveliness that she can righteously adorn for righteous purposes. We would never fault a bride for wanting to feel beautiful on her wedding day–and aren’t we all the Bride of Christ every day of our lives? The reality is that if we don’t guide our daughters through discovering and adorning their feminine beauty, the culture will teach them to profane it. What are YOUR ideas, dear sisters in Christ, for helping our precious daughters to recognize and foster their feminine beauty?